locked up overnight, as claimed by PM Bainimarama. It is more likely that these officers received instructions from someone to arrest the journalists to prevent them from questioning the management of Freesoul Real Estate Development, who are facing charges of violating their terms of development. Behind the unlawful arrest of the three NZ journalists last night, is a whole series of questionable activities relating to the illegal development by Freesoul at Malolo Island, including WHY the Fiji government did not intervene in time to prevent environmental damage. Responding to the arrest in a statement this morning, PM Bainimarama, obviously in damage control mode, has issued a strong denunciation of the desecration of the environment by the developers, adding that “the conduct of Freesoul Real Estate Development has been deeply concerning to me for some time”. If this is the case, we ask the PM why his ministries and departments concerned took no action against the developers despite repeated concerns expressed by villagers and other resort owners on Malolo Island, for much of last year. All of which were conveyed to the relevant ministries with photos of the devastation being wreaked. 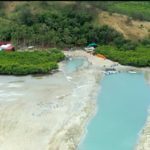 In fact, by at least September last year, both the Attorney General and former Minister for Environment, Praveen Bala, were sent reports and photos of the environmental damage being wreaked at Malolo Is by the company. If the PM’s current denunciation of the environmental damage to Malolo Island is to have any credence, he must carry out a full investigation into the entire issue surrounding Freesoul’s activities there and why his Ministries and Departments allowed the developers to defy Fiji’s environmental laws for so long without taking any action. Surely, it is time for some heads to roll. Government authorities refused to meet with Dr Chambers and others wanting to discuss the issue until February this year. Interestingly, barely two days after the Radio NZ article, the Director of Public Prosecutions’ Office finally slapped charges (on 9 February) against the company for unauthorized development and defying a prohibition order . The company submitted an Environmental Impact Assessment report with the Department of Environment in July 2018. BUT it had already begun development work on Malolo Island in May that year. Approval for the project was not granted until December 2018, following consultations with other stakeholders on the EIA. Even then the approval was restricted to work on the land, and not any foreshore activities. Approval for the building of a casino was also denied. Question: How is it possible that the company was allowed to continue causing serious damage to the environment between May and December last year, well before the development was approved? Secondly, Dr. Chambers complains that once final approval was given to Freesoul for its resort development, the objectors were not informed of this decision. This meant that the 21-day period for filing objections had expired without their knowledge. The people of Fiji have a right to ask: what is happening? Is there someone up in government that is protecting Freesoul Real Estate Development? We are reliably informed that the developers have very strong connections with some people in the top echelons of government. In fact, one of the villagers (affected by the development) told Radio New Zealand that the company had put money into coffers of FF for the 2018 general elections. It is time to ask: what hold do Asian developers have on the FF government that they are allowed to, willy nilly, take liberties with our laws, defy our laws, show no respect for our laws? The Freesoul case is definitely not the first. We had the case of China Railway Engineering Company, highlighted by FLP some years back which was allowed to develop land in Bayview Heights, Suva without approval being granted for its building and engineering plans? There is the much publicized case of Grace Road accused of allegedly using slave labour in Fiji for which its owners have been prosecuted in South Korea but the Fiji government can see nothing wrong with its activities here. When the Korean authorities tried to deport some of its cult leaders here, the Attorney General’s office intervened to stop them. They have been given government contracts worth millions of dollars. The case of the proposed $500m satellite city at Raiwaqa, Suva by Gold Century (Fiji) Ltd for which a deal was signed with PM Bainimarama in 2011. Nothing happened. Three years later, the Chinese speculators sold the land to the Damodra Group for a cool $19m and took off. Another $500m Wyndham Silk Road hotel complex proposed for the Coral Coast, near Komave Village, the groundwork for which was laid by then tourism minister Faiyaz Koya in 2016. The project was to be completed by 2018. Nothing has happened. The land is lying idle. We can go on with such duplicitous projects. Another that comes to mind is the development of an industrial park at Melimeli on the Suva-Deuba highway for which the ground breaking ceremony was done by PM Bainimarama. Has anyone noticed any works going on there?